Buying Highlands NC real estate involves choosing a location. However, a location is more than an address. Location means different things to different people. As a result it is important to understand that a location may have its own checklist that is individual to you. Your Highlands NC REALTOR will help you determine the ingredients that help you choose the ideal location for you and your family. 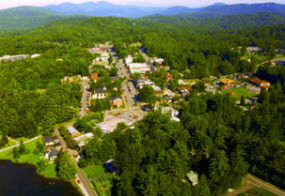 Ingredients that make up the ideal location for a Highlands NC home could include neighborhood. This means amenities, neighbors, and lot sizes, among other things. Maybe you are looking for a country club setting or perhaps a downtown setting. Regardless, amenities, space, and the makeup of the neighborhood may come in to play. Another, perhaps less thought of ingredient in location is sunlight. Some houses certainly have more shade than others and visiting a home at different times of the day is important. In the same vein another important aspect could be noise. If you are in an area where a lot of homes are being built you may be in store for a noisy few years. There are many aspects of location, a very important consideration when starting a Highlands NC property search. Contact me, Lynn Kimball, today to learn more about buying a home in Highlands NC. I welcome the opportunity to serve as your guide to the process. Let my knowledge and experience help you locate a home that suits both your needs and your lifestyle. Buying Highlands NC real estate is a big undertaking and I will help you every step along the way. Click here to read “Home Buying Checklist: What Else Does ‘Location’ Mean?” from Realty Times.